Five new Capcom titles now playable on Xbox One. 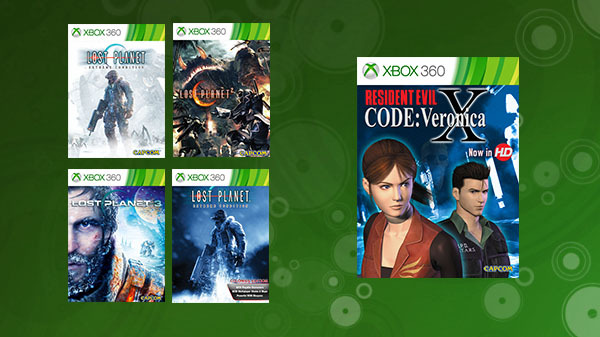 Lost Planet: Extreme Condition, Lost Planet 2, Lost Planet 3, Lost Planet: Extreme Condition Colonies Edition, and Resident Evil: Code Veronica X are now playable on Xbox One, Microsoft announced (2). Driven to the brink of extinction on ice-covered wastelands, humankind fights to survive. Battle to survive against gargantuan alien Akrid and treacherous Snow Pirates on the vast and frozen landscape of EDN III. With no allies at your side, the only thing you can trust is your instincts. Combining a gripping single player campaign and intense multiplayer modes with support for up to 16 players online, Lost Planet is an epic gaming masterpiece. Enormous world maps unfold as players battle across vast snow fields and deserted cities either on foot or in armed, robotic Vital Suits. Rediscover the world of Lost Planet 2, the latest entry in the 2.7 million-selling action shooter series! Over 10 years on from the events of the original, Lost Planet 2 returns to the troubled world of E.D.N. III, with a globe-trotting story of a planet torn apart by the battle for precious thermal energy. In addition to the all-new four-player co-op campaign, Lost Planet 2 introduces a new character customization system, an arsenal of new weapons and VSs to pilot, and a host of massive new Akrid to use them on. Lost Planet‘s famed online multiplayer battle also makes a return, with new maps, modes, and more for up to 16 players! With numerous multiplayer modes and a highly engrossing cinematic single player experience, Lost Planet 3 delves deeper into the Lost Planet universe, uncovering hidden truths within the unique environment of E.D.N. III. The Games on Demand version supports English, French, Italian, German, Spanish, Portuguese, Japanese, Polish, and Russian. Lost Planet has been enhanced with new maps and gameplay modes. Re-visit the great online action! The Games on Demand version supports English, French, Italian, German, Spanish, and Korean. It has been three months since the destruction of Raccoon City. Claire Redfield travels to Europe in search of her brother. Claire infiltrates the Paris laboratory of Umbrella Corporation, but is captured after a heated gun fight. The captured Claire is then sent to Rockfort Island, but shortly after her arrival the island is attacked! Amidst the chaos, a horde of zombies are released! Can Claire escape the horrors of the island? The Games on Demand version supports English.